I generally agree with the assessment of Washington Post, with respect to how well Maryland Governor Martin O’Malley’s “Ask Me Anything” on Reddit went for him, though I give him far more credit for venturing onto the unruly social news platform than the reporter did. The Post’s report that he only answered 5 questions was just plain incorrect. He subsequently logged back on in the afternoon to answer more questions, rebutting the Post’s assessment and that of a user: “I don’t know, I’m having fun! This is my first AMA. I had to step away to sign a bunch of bills, and I’m glad to be back,” he commented. @bmoreprogressive91: Thanks for doing an AMA. Just one question: How does the Maryland healthcare exchange, which cost taxpayers $90 million to implement before your administration found that it would be cheaper (at an additional $40-50 million) to just replace it than to fix it, show that your Administration has been effectively using taxpayer dollars to better the lives of individual citizens? O’Malley: No one was more frustrated than I was about the fact that our health exchange website didn’t work properly when we launched. But our health exchange is more than a web site, and we worked hard to overcome the technical problems. We have enrolled about 329,000 people thus far, exceeding the goal we set of 260,000. I often say that we haven’t always succeeded at first, but we have never given up. We learn from both success and failure. By the end of the day, Maryland’s governor answered 36 questions in total. 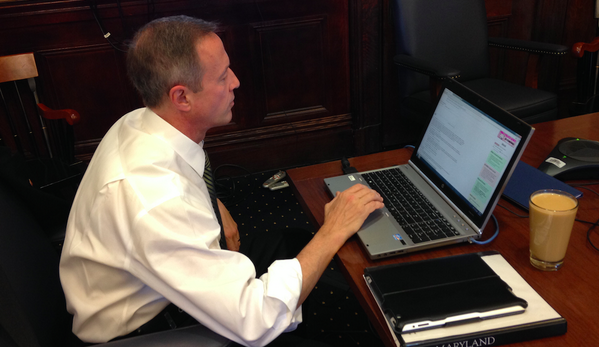 (You can read a cleanly formatted version of O’Malley’s AMA at Interview.ly). Reddit users rated the quality of some answers much higher than others, with the most popular answer, “Yes,” coming in response to whether he would support a constitutional amendment to reverse the Citizens United decision by the Supreme Court. To be fair — and reasonable observers should be — Reddit’s utility for extracting answers from a politician isn’t so great, as Alexis Madrigal pointed out after President Barack Obama did an AMA, back in 2012. That said, I’m generally supportive of elected leaders engaging directly with constituents online using the tools and platforms that citizens are active upon themselves. Popular questions that go unanswered can be instructive and offer some insight into what issues a given politician would rather not talk about in public. As such, they’re fine fodder for media to report upon. The record online, however, also means that when a reporter botches the job or misrepresents an interaction, question or answer, we can all see that, too. This post was further updated after the Governor went back online in the afternoon. Will Maryland’s new open data initiative be a platform for a more open government? Maryland joined 39 other states in the union when it officially launched its open data inititive on Wednesday. Governor Martin O’Malley unveiled Data.Maryland.gov at a panel discussion in Annapolis on Wednesday, at a panel discussion hosted in conjunction with the Future of Information Alliance (FIA), an inter-disciplinary partnership between the University of Maryland, College Park and 10 founding partners. The path to standing up Maryland’s new open data platform extends back into the last decade when the O’Malley administration and the state’s legislature first started taking substantive steps towards putting more government data online. 2008: Governor O’Malley launched StateStat, publishing performance and management statistics online. The governor subsequently touted the use of performance data a year later as a way to save taxpayer dollars. “RSS, XML, GIS, API: this is what smart, transparent governance will look like in the years ahead,” he said. 2010: Maryland webcasts more hearings and meetings online. May 2013: Maryland launches data.maryland.gov using Socrata’s cloud-based open data platform. While the launch of an open data platform is an important digital milestone, it doesn’t in of itself address substantive concerns about Maryland’s open government challenges. TechPresident asked whether Maryland becoming the open government state in 2011, a question that came loaded with decades of context. On the one hand, the new open data is a substantive step towards addressing the criticisms of open government advocates who noted that Maryland was lagging other states in the nation in its digital initiatives. On the other, the 236 datasets on data.maryland.gov at launch do not include spending data. Many transparency advocates would like to see that change: Maryland received a low grade in PIRG’s annual report on government spending, as examined through the prism of data delivering online. The state government’s compliance with Maryland’s Freedom of Information Act (PDF) is also unclear. While journalists, researchers and other freedom of information requestors now have a new way to ask for data (a nominate button on the new open data website) if they don’t receive an immediate reply, they’ll be hard-pressed to know who to turn to in individual agencies. There is, as of yet, no comprehensive list of Maryland FOIA officers online yet, nor independent institution, auditor or ombudsman with statutory authority to ensure that FOIA requests are complied with in a timely or effective manner. It’s unclear whether any of this new open data will substantially mitigate Maryland’s record on transparency. According to report card by State Integrity, Maryland ranks 40th in the nation when assessed on 14 different categories</a. While access to electronic information may improve, Maryland’s story includes a political history rife with corruption in the latter part of the 20th century and a present marked by murky procurement policies, oft-ignored auditors’ reports, spotty access to information and limitied executive and legislative branch accountability. As Christian Borge detailed for Public Integrity in August of 2012, Maryland faces open government challenges around lobbying, contracting and political cronyism. Websites like StateStat, BayStat, and GreenPrint have featured data disclosures made at the discretion of the O’Malley administration, as is the case with this new open data platform. The state of play in Maryland is an excellent example of the ambiguity of open government and open data, where states release data relevant to services, performance or of economic value but not requests from the media for information related to the exercise (or abuse) of power, the existence of policial corruption or potentially embarrassing errors. This state of affairs is what led to iSolon.org president Jim Snider to decry Maryland’s fake open government in 2010, much as open government advocates have criticized the Obama administration’s record on open data, open government and FOIA compliance. As Snider pointed out in March, Maryland’s Board of Elections also has serious open government issues. Whether any of this figures into the 2014 election for governor remains to be seen. Maryland Attorney General Doug Gansler is a leading contender in the crowded field in the developing 2014 MD gubernatorial race. Whether the leading law enforcement official in Maryland chooses to make open data or open government part of the issues in his campaign is, like the political winds in Annapolis, not clear. To date, Gansler’s record on technology primarily has focused upon targeting sexual predators on social networking sites, not using digital technology to make Maryland government more open, transparent or accountable to its 5.8 million people. None of this means that Maryland’s new open data initiative won’t matter for government transparency, improved civic services or economic activity in the private sector. This step forward does matter and adds what increasingly looks like a basic building block for governance to Maryland’s toolkit. It just means that the citizens of the Old Line State by the Bay need to keep asking for more than data from their elected officials.